The Filter Panel allows you to create filters in your workspace to show you a pre-set view of data based on particular conditions. For example, you may have a dropdown with High School, College, and Graduate School, but may wish to only view data submitted by High School students. You can set a filter such that only responses to that question where the choice 'High School' was selected will be shown. Filters have varying levels of complexity - they can combine several fields, they can include some or all of the conditions you create, and can involve conditions such as "is/isn't," "contains/does not contain," or "greater than/less than." It is recommended you map out which data you would like to see before you begin setting up filters in Zengine. The Filter Panel exists in a number of functions throughout Zengine: Data Grid, Rules, Permissions, and Summary Fields, to name a few. At this point, you can begin setting up a filter. Note: Thhe fields present in the Filter Panel can vary based on the feature or plugin that you are utilizing. Access the article particular to that feature if you want to learn about the fields unique to that feature. 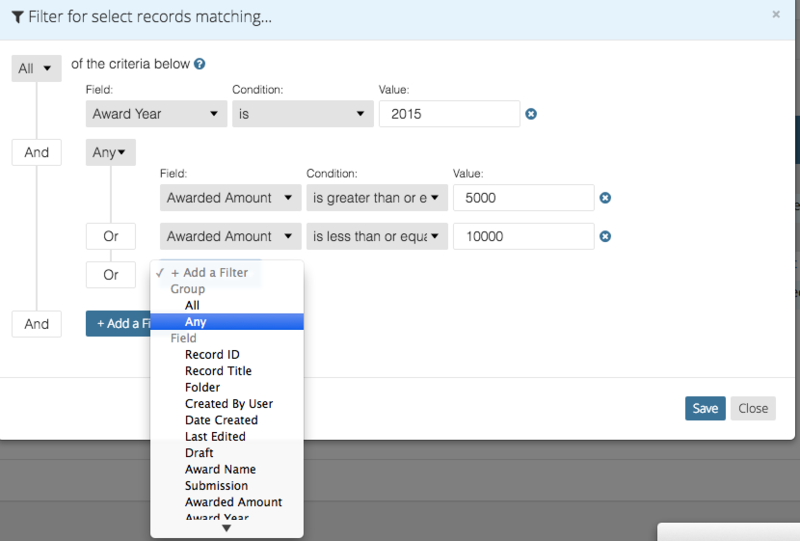 All/Any By selecting "All," it means all of the criteria have to be met in order for data to show for this filter. By changing this to "Any," if you have multiple criteria, just one has to be met in order for the data to show. Field Here is a dropdown of available filterable fields from the form(s) in question. Condition Depending on the field type selected, you will see a set of possible conditions for your filter, such as "contains," "greater than," or "starts with." See more about Conditions below. Value For fields with preset values (dropdowns, checkboxes, radio buttons, etc), you can choose which value(s) the filter will be based on. For open-ended fields (text boxes, etc), you can write in a particular value that you would like the filter to be based on. There are a number of possible conditions you can choose from, which must be met by data in order to be shown in the filter you are creating. is / isn't Here, the data would have to exactly meet the Value. If you are entering the data yourself, you will want to be careful regarding upper v. lowercase, punctuation, spaces, etc. Just adding one space to the Value will impact which data is filtered out. For example, if you want to see only data where the Value is "NY," and someone entered "N.Y." that would not show up in your filtered results. contains / does not contain This could be utilized for longer responses to ensure that the word or phrase in question appears somewhere in the response. If there is a textbox where you want to see results only where users entered the phrase "engineering," you could enter this in the Value. Conversely, you can filter to show only results that do not contain a particular word or phrase. starts with / ends with While for "contains / does not contain," the word or phrase would have to appear somewhere in the field, this Condition is set such that the word or phrase has to be at the beginning or end of a response. For example, perhaps there are a number of possible Business Majors: Business Intelligence, Business Management, etc. Instead of setting several filters for Business Management and Business Intelligence, you can set the filter to show all responses that start with "business." exists / does not exist Here, you can set whether data simply exists or does not exist in the field. The Value field will become read only if this selected. since / before If you select a Date Field, you can show data that occurred since a particular date or before a particular date. greater than or equal to / less than or equal to If you select a Number Field, you can show data that is greater than/equal to a particular field, or less than/equal o a particular value. In the example below, we have set up a filter such that we only see project submissions to the category " Combat Underage Drinking" that have been submitted since 1/1/2017. You can add as many filters as you wish and can utilize the "x" icon next to that filter in order to remove it. Click the blue "Save" button when you are ready. 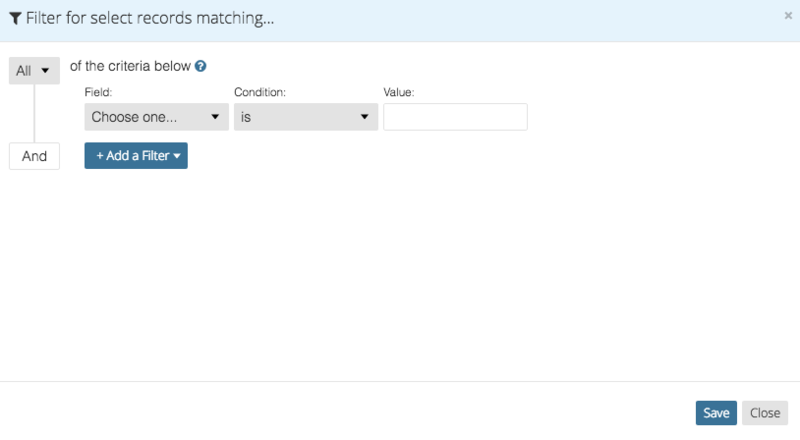 You can add as many filters and combinations as you wish to utilize the "All/Any" feature. 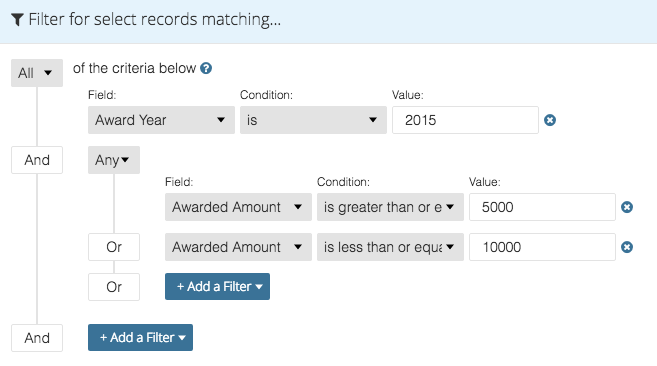 Remember, by selecting "All," it means all of the criteria have to be met in order for data to show for this filter. By changing this to "Any," if you have multiple criteria, just one has to be met in order for the data to show. However, sometimes your filter may be more complex. You may wish ALL of one criterion to be met, but ANY of another criterion. In order to accomplish this, you would create a group. In the following example, we want to look at awards only from the year 2015 but would like to have a subgroup of those awards that are EITHER greater than $5000 OR less than $10,000. The Awarded Amount sub-filter here is called a group. In order to add a group, you would click the blue "+Add a Filter" button. Instead of selecting a field from the dropdown, you will see the top " Groups" with "All" and "Any" as options. Selecting one of those options from the dropdown will thus create a group and allow you to have even further flexibility with your filter.